It's not a day lost. It's a day invested. With seven to choose from, you could hit a new one every day of the week. Without giving up the views. Browse restaurant menus until something strikes your fancy. A setup so nice, even non-cooks may be inspired. These five condo towers are like the islet’s exclamation point, the final resort, before the scenery gives way to miles of untouched beaches. Portofino Island Resort by Wyndham features many of the best condos within the Portofino Island Resort community. Unique in that it spans the entire width of the island, it gives you double the beachfront with access to a beach on the sound and another facing the Gulf. As if two beaches weren’t enough, there are so many pools (seven!) you practically need a menu. Fitness fans will appreciate the four tennis courts and state-of-the-art fitness center. Plus can rent bikes, tricycles, and moped scooters to explore the beach town and expansive dunes. Be sure to make a midday escape to the on-site spa. And when the day winds down, hit the boardwalk restaurant area before settling back into your condo residence, complete with full kitchen, living room, dining area, washer/dryer, and beachfront balcony. The check-in location differs from the property location. 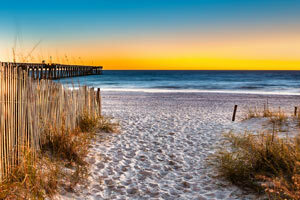 To check in, go to ResortQuest Pensacola Beach Office at 731 Pensacola Beach Blvd, Pensacola Beach, FL 32561. The check-in office is open 9:00 AM-5:00 PM daily. Guest that arrive late can pick up keys to the unit using information on the booking confirmation.